HARGEISA, 11 August 2015 (IRIN) – Qader and Abdi are two weeks into their journey. Carrying only one empty plastic water bottle each, flattened, with no liquid to return it to its cylindrical shape, the two men figure they will be walking for another month-and-a-half before they reach the sea. From there, they will take a smuggler boat the short distance to Yemen, where another 600-kilometre walk lies ahead before they may reach their final destination, Saudi Arabia. The pair – members of Ethiopia’s largest ethnic group, the Oromo, which activists charge is systematically disenfranchised by the government – are walking along an uncrowded road connecting the capital of Somaliland, Hargeisa, to a northern port city. They walk because they cannot afford the roughly $150-200 that a series of smugglers would charge to take them from the Ethiopian border east through Somaliland to the port of Bosaso in the neighbouring semi-autonomous region of Puntland.“We will walk until we become weak,” said 30-year-old Qader, who withheld his last name to protect his identity. He and his 19-year-old companion are dressed in dirtied long-sleeve shirts to shield them from the early morning sun, which will become unbearable by midday. They have made it this far off the good will of Somalilanders who offer them small change or meals as they pass.There is a small risk they could be arrested so they veer off the paved road near checkpoints but quickly return so as not to lose their way. Although walking along roads in Somaliland – a self-declared nation that the international community still classifies as a region of Somalia – puts migrants like them at increased risk of robbery or assault, Somalilanders generally do not wish the duo ill will. Government officials have even been known to stop and provide food and drink to migrants despite their illegal status in the country. When they reach Bosaso the help will likely come to an end and Qader and Abdi will have to pay. Unlike on land, which the destitute can traverse without charge as long as they can avoid arrest, the sea is only passable by ships operated by smugglers, who are more than happy to continue transporting people to war-torn Yemen for a fee. Migration to and through Yemen – historically the backdoor for migrants and asylum seekers from the Horn of Africa trying to reach Saudi Arabia – has always put people at risk of death and inhumane treatment. Last year, there were numerous drownings in the Gulf of Aden and Human Rights Watch released a report in 2014 documenting “torture camps” where smugglers held newcomers for ransom. But a civil war, precipitated by the departure of Yemen’s internationally-recognised government and a Saudi Arabian-led bombing campaign to restore its legitimacy, has made an already perilous journey for migrants all the more death-defying. “It’s very dangerous, and I cannot stress that enough,” said Teddy Leposky, an external relations officer for the UN’s refugee agency, UNHCR, in Yemen. Not only has the war given smugglers license to act more ruthlessly than before, but also the ability of aid agencies to provide services to migrants and refugees has been severely compromised and the conflict’s violence has been indiscriminate. Five migrants were caught in shelling near the Saudi border in May and, at the end of March, a camp for displaced people camp was bombed, killing at least 45. But as migrants and refugees know, the grinding poverty, political persecution or violence that typically push them out of the Horn of Africa, do not conveniently abate as wars break out in their path. So they continue to risk life and liberty and end up on Yemen’s shores. According to figures from UNHCR, more than 10,500 people have arrived in Yemen since March when the bombing campaign began. Although some of those might be part of the 51,000 who are now also leaving, as war in Yemen has created a circular flow in the region. Some aid officials believe that boat smugglers in Bosaso and Djibouti (for the Red Sea route to Yemen) may be downplaying the conflict in Yemen or flat-out lying to clients about the dangers they have seen. Fila Aden in Hargeisa doesn’t doubt smugglers are sugarcoating forecasts, but he thinks the conflict in Yemen might actually work to his advantage. He is reassured by news that one of his friends just traversed Yemen and slipped unnoticed across the border with Saudi. As long as those like Aden are willing to go, there is money to be made. Several sources said the smugglers had doubled their asking price in Bosaso, which pre-war ran from $60 to $120 for the sea crossing. Omar, who asked that a pseudonym be used, smuggles Ethiopians from the border into Somaliland. He is fairly new, joining the ranks of the illicit business just five months ago. But the job has proven lucrative. He saw a drop in numbers around the time war broke out in Yemen, but Ramadan (which straddled June and July this year) was profitable, suggesting an uptick in those still willing to go to Yemen. While Omar continues to facilitate a migrant march east, deteriorating conditions in Yemen have destroyed a refuge that many once sought. Abdulqader Ahmed, a 17-year-old Ethiopian migrant, arrived in Yemen in March from Djibouti right as street battles began to erupt in the southern port city of Aden. He made his way to the UN-sponsored al-Kharaz camp nearby, too afraid to begin his journey north to Saudi Arabia. He watched as the camp ran short of food and water, with aid agencies unable to get supplies in. Finally, he managed to secure passage on a ship that evacuated him to Somaliland. At a migrant response center in Hargeisa, where he was waiting to be repatriated back to Ethiopia, Ahmed said the war in Yemen had helped him reach the realisation that his goal of getting to Saudi Arabia would likely cost him his life. He now intends to return to farming with his father in Ethiopia, even though it will be almost impossible to earn a living. For UNHCR’s Leposky, Yemen’s collapse is particularly concerning because of the country’s history of opening its borders to refugees and asylum seekers. He told IRIN that those arriving now in Yemen are making the costly journey across the sea only to find themselves in a similar situation, if not worse. With E.U. leaders finally working on a Europe-wide refugee policy, there is growing concern among some migrants and aid officials that the new policies might unwittingly divide the migrants into two distinct classes—with two different kinds of welcomes. First, the hundreds of thousands of Syrians fleeing the war back home, whose stunning flight into Europe has seized world attention; and second, the hundreds of thousands of much poorer, less educated newcomers who have also fled dire circumstances in Africa. Yet, for some of the 80,000 or so who have landed in Sicily this year—the vast majority African—the promise of fairness for all sounds unconvincing. Africans who have fled deadly, often forgotten conflicts, or various kinds of persecution—including religious and anti-gay violence—say they believe it could take years to win refugee status or residence in Europe, if they ever receive it at all. Those simply fleeing poverty, and there are many, are not eligible for asylum. Instead, many predict a long, tough road towards acceptance and employment somewhere on the continent. Several African asylum-seekers in Sicily described overwhelming bureaucratic hurdles towards those goals — a far different picture than the tens of thousands of Syrians whom the E.U. and U.S. now appear willing to host. Yet both sets of newcomers share one experience: life-threatening journeys to Europe. “”We risked everything to cross the Mediterranean,” says Samate, a tall 17-year-old from Senegal, sitting in a detention center in the Sicilian town of Messina on Wednesday. He said he fled his home last February after separatist rebels in the disputed Casamance region where he comes from tried to draft him into battle. The Italian Coast Guard rescued him and other migrants as they tried to cross the Mediterranean on in late July, and brought them to Sicily. About half of those who have landed on Europe’s shores this year have been Syrian, according to the U.N. refugee agency, most crossing from Turkey to Greece, before moving quickly on to Austria, Germany and Sweden. But a large portion of the rest are Africans who have crossed from Libya to Italy—a more lethal sea route that has so far killed more than 2,200 migrants this year. Most have arrived after hair-raising treks across the vast, searing Sahara, and then weeks in Libya’s migrant jails. Samate’s five-month journey included working for traffickers in Niger and Libya at meager wages. Far different from the Syrians clambering off boats in Greece, the Africans land in Sicily penniless and empty-handed. When I ask to see what they carried with them, most look puzzled, then point to the clothes on their back. “I arrived with nothing, not even my documents,” said Mandjo, 16, from Guinea, who fled when religious violence destroyed his village. What little he grabbed as he fled was lost to bandits along the way. To underscore her point, Di Benedetto whips out her iPhone to show me photos of dead African infants whose bodies washed ashore on a beach off Zuwara, Libya on August 28, when their smugglers’ boat capsized. About 200 people drowned when the ship overturned. Five days later, a photo on a beach off Bodrum, Turkey showed another dead toddler: Aylan Kurdi, a three-year-old Syrian boy. That image finally jolted EU leaders into action. “Syrians of course need help, but they are not the only ones,” Di Benedetto says. Shaking her head at the photos of dead African children on her phone, she says she wonders whether Aylan’s “white skin” made the difference. Such programs, sorely needed, could take generations to work, however. In the meantime, thousands of African migrants await settlement inside Europe’s borders. Posted by OromianEconomist in Oromo Refugees in Yemen. Posted by OromianEconomist in Africa, Human Rights Watch on Human Rights Violations Against Oromo People by TPLF Ethiopia, Oromo Refugees in Yemen. 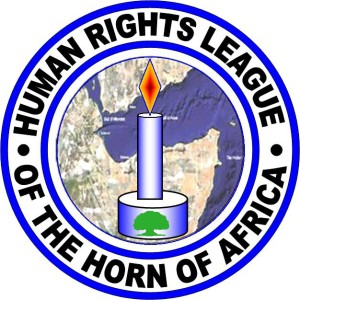 The Human Rights League of the Horn of Africa/HRLHA is very concerned about the current humanitarian crisis in the Republic of Yemen following the internal conflicts and political instabilities that have broken down the social services in the country. Many nongovernmental and humanitarian organizations are reporting that the crisis in Yemen has highly affected refugees and asylum seekers who came from the Horn of Africa to Yemen to escape the volatile situations in Somalia, Ethiopia, Eritrea and other places. Among the most vulnerable are Oromo refugees and asylum seekers residing in Sanaa, Aden and other areas in Yemen. HRLHA, Amnesty International and Human Rights Watch have reported and are still reporting that the Oromos are fleeing their country to escape persecutions by the current Ethiopian government led by the TPLF/EPRDF. The recent research document released by Amnesty International – “Because I am Oromo” – Sweeping Repression in the Oromia Region of Ethiopia – exposes that how Oromos have been regularly subjected to arbitrary arrests, prolonged detentions without charges, enforced disappearances, repeated tortures and unlawful state killings since 1991, when the current Ethiopian government came into power, as part of the government’s incessant attempts to crush dissidents. Thousands from other nations and nationalities in Ethiopia have also been killed, kidnapped and arrested by the TPLF/EPRDF government because of exercising their fundamental rights or holding political opinions different from TPLF/EPRDF’s political agenda. 2. Move them to safer neighboring countries in the Middle East or beyond. Posted by OromianEconomist in The Tyranny of TPLF Ethiopia. This article provides photos and personal stories of some of the many migrants risking the Mediterranean crossing to arrive in Europe. This dangerous undertaking would not be attempted if the situation they left behind was not so dire. Posted by OromianEconomist in Africa, Oromo the Largest Nation of Africa. Human Rights violations and Genocide against the Oromo people in Ethiopia. The following is a statement from the Oromo Community of Minnesota. The Oromo Community of Minnesota (OCM) is sending an urgent appeal to all governmental, non-governmental and UN humanitarian agencies, on behalf of Oromo refugees stranded in Yemen due to the ongoing fighting in that country. The Oromo in Minnesota, the largest Oromo community outside East Africa, is following the plight of refugees in Yemen with great trepidation. Our compatriots make the difficult decision to flee from their beloved homeland due to rampant and persistent persecution by successive Ethiopian regimes. Their choices are either to stay in their country and remain silent over the daily injustices or speak up and get sent to prisons for the simple reason of asserting their inalienable rights; dare to oppose violations of human rights and face disappearance, long incarceration without trial, and extra-judicially killings simply because, to use the words of Amnesty international’s recent report, they are Oromo. These refugees had to cross through harsh environments to get to the Gulf of Aden and then board overcrowded boats. They took these risky steps to escape more serious dangers at home. As the situation in Yemen deteriorates, most of the Yemenis have moved out to the relative safety of the countryside, while other refugees have left to other countries. The only helpless ones still stranded in urban centers are Oromo refugees. We are gravely concerned for their safety. Our urgent appeal is for the protection of their critically endangered lives based on humanitarian grounds and their evacuation to a safer country. We humbly request that repatriation to Ethiopia not be an option as they are going to face persecution by the Ethiopian government, which is what drove them to make the excruciating choice of becoming refugees in the first place. Therefore, the Oromo Community of Minnesota is appealing to all humanitarian agencies and all individuals of goodwill to do all things in their means to assist our brothers and sisters caught up in the present tragic situation in Yemen. Our community is ready and on standby to cooperate with humanitarian agencies in their concerted efforts to save the lives of our people. Posted by OromianEconomist in Macha & Tulama Association. The Board of Directors of the Macha-Tulama Association, USA, is writing this urgent letter to bring to your attention about the suffering of thousands of Oromo refugees and other nationals in Yemen, South Africa, Libya as well as in the Middle East and Africa. Among these refugees were individuals who were killed or beheaded by terrorists and other criminal elements. Furthermore, the most vulnerable elements of these refugees such as the sick, women, children and elderly are dying every day. At this moment no calling is more urgent and noble and no responsibility greater for the leadership of UNHCR than trying its very best for saving the lives of thousands of Oromo refugees and others who are trapped among warring factions in Yemen and attacked by terrorists in Libya and burned by criminals in South Africa. 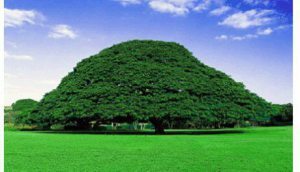 The Macha-Tulama Association (MTA) is a non-profit organization legally registered in the United States of America for advancing the objective for which the main MTA was established in Oromia (Ethiopia) in 1963. For your information, the Oromo constitute the single largest national group in Ethiopia. And yet, they are political minority in that country. Consequently, successive Ethiopian governments, including the present one, have banned MTA, the only civic institution of the Oromo people in the Ethiopian Empire. The MTA envisioned mobilizing Oromo citizens for fighting illiteracy, diseases, constructing schools, building roads and clinics, promoting Oromo self-consciousness, and reviving Oromo language, culture and history. It also struggled to restore the human dignity and inalienable rights of the Oromo people that have been suppressed by successive Ethiopian regimes. Continuing the policies of the previous regimes of Ethiopia, the current minority Ethiopian government has intensified political repression as well as land-grabbing and transferring other economic resources of the Oromo and other peoples to the current government officials, their supporters and foreign corporations. It is the Ethiopian government’s policy of illegal land grabbing and political persecution of the Oromo and others that have forced the young, old, women and children to flee from their fatherland and get exposed to dangerous conditions in foreign lands. Oromo refugees and other nationals who have been forced to leave their homeland by the political and economic repression of the current minority Ethiopian government are exposed to gross human rights violations and terrorism. These refugees have been forced to flee from their homeland in order to seek protection from persecution, arbitrary imprisonment, torture and extra-judicial killings because of their ethno-national and religious identities, political opinions and their economic resources. According to Amnesty International report, entitled ‘Because I am Oromo: Sweeping Repression in the Oromia Region of Ethiopia, between 2011 and 2014 at least 5000 Oromo were arrested, tortured, and faced extra-judicial executions because of being Oromo, and for also peacefully demonstrating against the regime’s land grabbing policies and the so-called Addis Ababa Master Plan that has been intended to evict millions of Oromo farmers from their prime land around Addis Ababa (Finfinnee), the capital city of the Ethiopian Empire. • First, we request that the UNHCR demand that the governments in Yemen, Libya and South Africa provide protection for Oromo and other refugees who have sought protection and safety in their countries. • Second, we request that the UNHCR provide material support urgently for those Oromo refugees and others who are trapped among warring factions, especially in Yemen. • Third, we appeal to the UNHCR to arrange suitable conditions with other countries for these refugees to have an opportunity for permanent settlement in third countries. • Fourth, we request that the UNHCR seeks permanent solutions through the United Nations for eliminating political and economic conditions that have produced tens of thousands of Oromo and other refugees from Ethiopia. • Fifth, we request that the UNHCR persuade big powers and international financial institutions not to finance the Ethiopian government’s policy of land grabbing, which has evicted tens of thousands of Oromo nationals and others from their ancestral lands. We believe that as the UN High Commissioner for Refugees and the principal voice on refugee issues, you have an extraordinary opportunity to alleviate the incredible human sufferings of the Oromo and other refugees in Yemen, Libya and South Africa and in other countries. 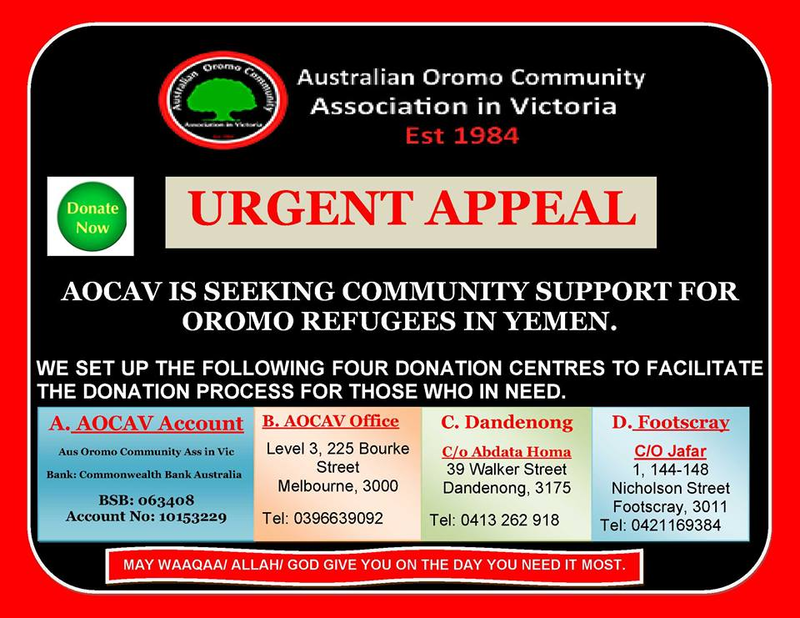 We urgently request you to take a concrete measure that will save the lives of Oromo and other refugees who are trapped among warring factions in Yemen. Additionally we request you to urge the government officials of Libya and South Africa to protect Oromo and other nationals in their countries. Finally, we thank you for your interest in the wellbeing of the Oromo and other refugees from Ethiopia and for taking concrete actions to protect them. The United Nations, New York.